The next feature I’ll be working on is Soul Brands! I’ve written about them briefly here and there, but I’ve rarely gone into any detail before, so allow me to give a brief explanation here. But first, the usual disclaimer: This all reflects current planning of a feature VERY EARLY in development. Plenty of this could still change, but it can still be regarded as a good first draft of where things are headed. Soul Brands function as “equipment” for summoners and demons. Characters can have one Brand equipped at a time. A summoner’s relic can store a small number of Brands at a time. Credits can be spent to copy a Brand onto a character: this consumes only the credits, not the Brand. Thus, a single Brand can be copied to any number of characters. Players will probably find roughly one to two new Brands per dungeon floor on average. If you later discard a stored Brand (to make room for a new one), this does not remove that Brand from any character(s) it was copied to. Enemy summoners will of course utilize Brands as well. Like a player can, they may have Brands equipped to demons that they no longer have stored in their Relic, reflecting the total selection they have found in their careers. Of course, Relic Wraiths and their demons will also use the Brands they had found before the unfortunate summoner’s first death. Level: The level of a Brand determines the size of the bonuses, penalties, and requirements it has. Brands you find in the dungeon will usually have a level roughly matching the character levels of the demons found on the floor in question. Boon: Boons are the reason you want to equip a Brand in the first place. Boons are bonuses of some kind, the intensity of which is usually based on the level of the Brand. Bane: Banes are penalties of some kind… but their presence on a Brand increases the bonuses provided by Boons. When: Whens are a short-term condition that must be met for a Brand’s Boons and Banes to be in effect; generally these are conditions that you may or may not meet from turn to turn. 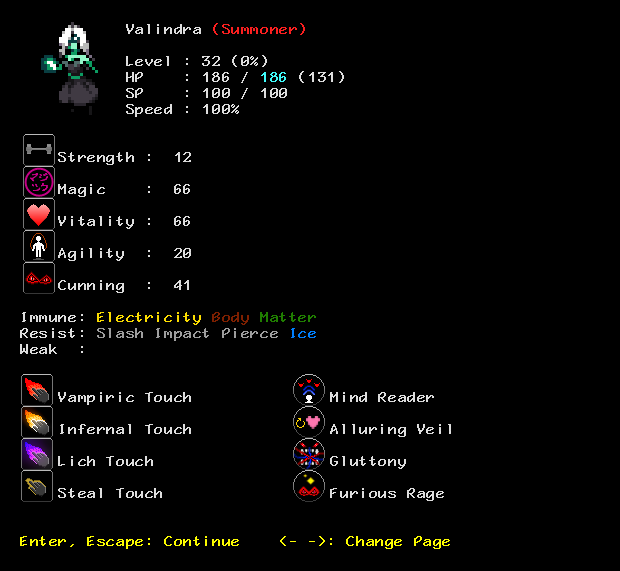 For example, “HP <= 50%”, or “Last ability was a movement ability.” Whens also increase the bonuses provided by Boons. If: Ifs are a long-term condition that must be met for a Brand’s Boons and Banes to be in effect; generally these are conditions that check things that are hard or impossible to change, restricting who can use the Brand. 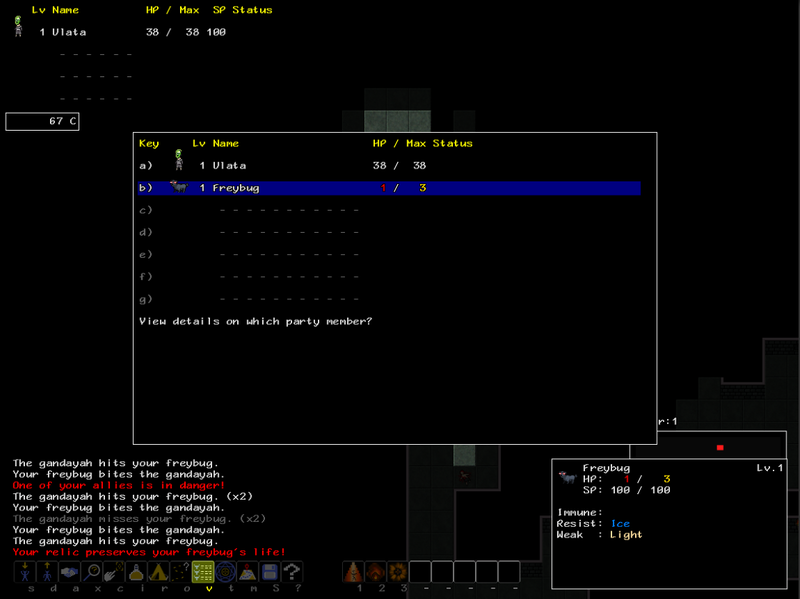 For example, “Weak To Fire”, “Base Strength > 50″, “Must be Unique”, etc. Ifs also increase the bonuses provided by Boon. Every Brand has at least a Level (of course) and one Boon. The other components are optional. Brands are procedurally generated using lists of Boons, Banes, Whens, and Ifs. I will probably rename Whens and Ifs. That’s it for now. As I said above, this is pretty early in development, so it may be a bit before the first screenshots or more details are ready. Cheers! New build released! Links to the right have been updated! 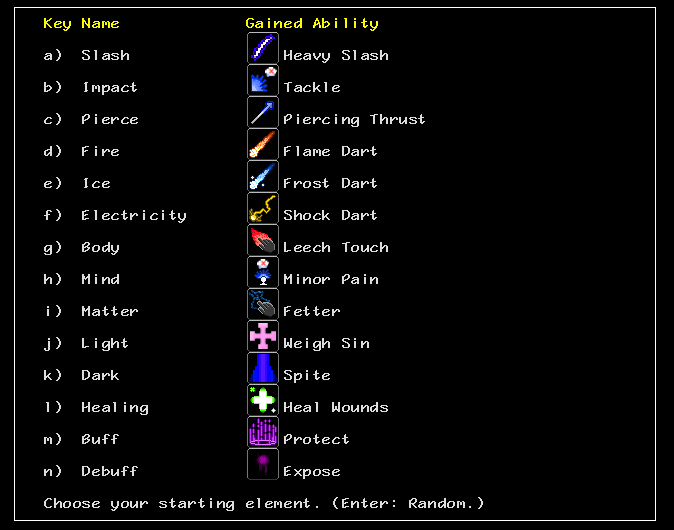 Can’t promise this build is anything too exciting: mostly just bug fixes, largely related to Demon Preservation. But, I wanted to get them out of the way before starting on the next, more interesting build. Enjoy, and good luck in the Tower! New computer is up and running. Will finish reinstalling things tomorrow and then it’s back to work with… the remaining one day of Thanksgiving break. Ah well, I shouldn’t complain, this happening on the break at least meant I had time to focus on it and deal with it quickly. Working on getting back in action as soon as possible. Shouldn’t be toooo long hopefully. Hey. I hope everyone’s enjoying the 11/9 build. The next build will probably be a bug fix / polish build: the list has gotten a bit long again so it’s time to knock it back down to keep things running smoothly. And after that? I haven’t decided yet, but I’ll let you know once I do. Until then, good luck in the Tower. The newest build Demon is released! Links on the right have been updated! * Revamped Character Creation: Character creation has been significantly changed: in addition to being more streamlined, the overall power of starting characters has been significantly reduced, to make early game choices much more interesting and meaningful. * Reduced Restrictions: Two major restrictions have been removed. It is now possible to have multiple of the same demon (without using Fuse Demon), and it is now possible for both summoners and demons to have no Weaknesses (via Soul Armor and Fuse Demons, respectively.) However, the inherent instability of a physical form with no Weaknesses causes a notable reduction in MaxHP… perhaps such perfection is best left to those with the Vitality to handle the strain. Other small changes and bug fixes have been included as well: you can read all about it in the change logs included with the builds, as always. Good luck in the Tower! I hope to have the new build ready by late tonight CST. Just one small new thing to add and some testing is left to do, so I should be able to knock it out after I get home from work. Cheers!